A few states have taken their vital records online. These are mostly births and deaths, but sometimes marriages and divorces as well. Diligent state bureaucrats or dedicated volunteers from historical societies and the like have entered millions of records into online databases or better yet, scanned actual images of birth or death certificates, and all the wonderful information they contain. And they've done all this for your benefit, just so you can look up vital records online, and fill in more of your family history. West Virginia Death Index 1917-1958. Coverage here varies by county; also includes some birth and marriage indexes. Actual images of certificates available. Washington State Digital Archives. There are birth, death and marriage records here, along with census information, military records, and a host of other information. Coverage is very variable. Utah Death Index, 1905-1956. Database includes digitized images of the death certificates. Also check out the Utah Burials Search. Oregon Death Index, 1903-1930. Basic information here: Name, date of death, county, and certificate number. Ohio Death Index, 1913-1944. Just the basics here. Lookup is free, the certificate will cost you. North Dakota Department of Health's Death Index from 1881-one year before present. You must specify date of death within a ten year period in order to get search results (why oh why did you do that, NDDOH?). Missouri Death Certificates, 1910-1958 (with images). Also check out pre-1910 birth (including stillbirths) and death records. Minnesota Death Certificates, 1904-2001, from the Minnesota Historical Society. Search and results are free, but there is a charge for an actual copy of the death certificate. You can also search the Minnesota state census for 1849-1905. The Maryland State Archives Death Index (1898-1951) offers county by county lookups of death records. There are also separate databases for Baltimore covering death records from 1875-1972. The set-up here is cumbersome, but worth playing around with if you have family history in Md. Kentucky's online vital records include a death index (1911-1992) and a marriage and divorce index for 1973-1993. Information is largely limited to name, place and date, with pointers to the original off-line files. Illinois State Archives has a pretty incredible collection of not only birth and death records, by poorhouse records, court case, probates, and much more. Their Global Search allows name-searching of all databases at once. Idaho's digital archives include death records, though these appear to be excerpts from the freely available SSDI database. 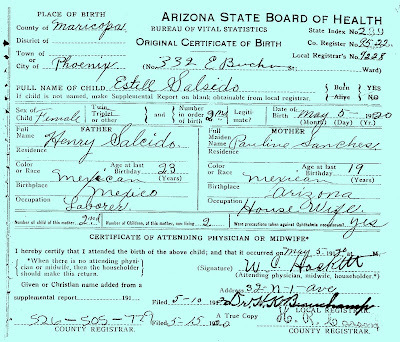 The Arizona Genealogy Birth and Death Certificates site is very nice, very fast, and includes actual images of birth and death certificates for births that occurred at least 75 years ago, and deaths that occurred at least 50 years ago. In addition to including individual names, the database lookup includes parents' names as well. Most online vital record lookups are organized at city or county, rather than state level. Here's a good list of local death records online. I thought California and Ohio had also put death certificates online. Am I mistaken?